The Lower Sacramento River begins at Keswick Dam, near Redding California, and it is the collection of all the rivers upstream to Shasta Lake. The 25-mile stretch of river is some of the most productive rivers in the west. Interstate 5 runs along the river, which allows for fairly easy access. The fish in the Sacramento River are continuously fed by a never-ending supply of insects so they get big and strong averaging about 16”. The Rainbow Trout fishing is amazing on this river and if that is not enough the river also contains Steelhead and Chinook salmon. With the warm temperatures the river also has its share of Largemouth and Small mouth Bass, stripers and squawfish. This river requires heavier gear, you will need a 7 to 9 weight fly rod. During the summer months it will be difficult to wade this river because of the high flows, so the use of a drift boat is required. Best fishing is when the flows are between 5,000 and 8,000 feet per second, but they can get as high as 80,000 during the spring run off. Wading from fall to spring in most areas is very possible, and the weather is much cooler than during the summer months. If you do decide to wade the river beware that there is private property along the river, so gain access to the river via the public parks or access points between Redding and Anderson. This is a year round fishing river and if you are looking for lots of fish, or big fish then you should check out this great stream. This is a very popular fly fishing destination since it is close to some heavy populated areas. Don't worry, there is still plenty of room to fly fish this stream. 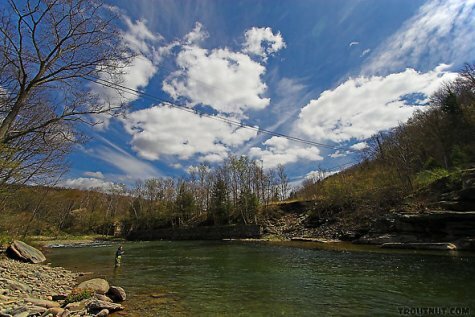 The best section to fly fish is between Keswick Dam and Balls Ferry. There are many guides that provide river fishing trips, and this Sacramento fishing is worth checking out. Map of this great trout stream. To leave the Lower Sacramento River and return to the California page. Do you need a fly-fishing guide?